Awards given to Public Relations Companies for PR, Marketing and Social Media Campaigns are always an honor to receive. Who wouldn’t want to receive recognition for hard work that resulted in success for our clients? But it is the work that The Conroy Martinez Group does, day in and day out, together with our clients that has the most meaning for our Public Relations agency. Assisting clients as they increase sales, improve brand awareness, grow their reputation, and experience success is how we truly measure success. We have been fortunate to have won many PR and Communications awards over the years. The Bulldog Awards, PR News Awards, PRSA Awards, Latin Builders Association Awards, Florida Hospital Association Awards, PRGN or Public Relations Global Network Awards, to name a few. These awards recognize outstanding campaigns that create results; that are creative, unique and actually show off the finest in PR. The Conroy Martinez Group is an award-winning Miami PR firm, but as honored as we are, we are more excited to partner with our clients. The mutual respect, success and growth is what matters the most to us. 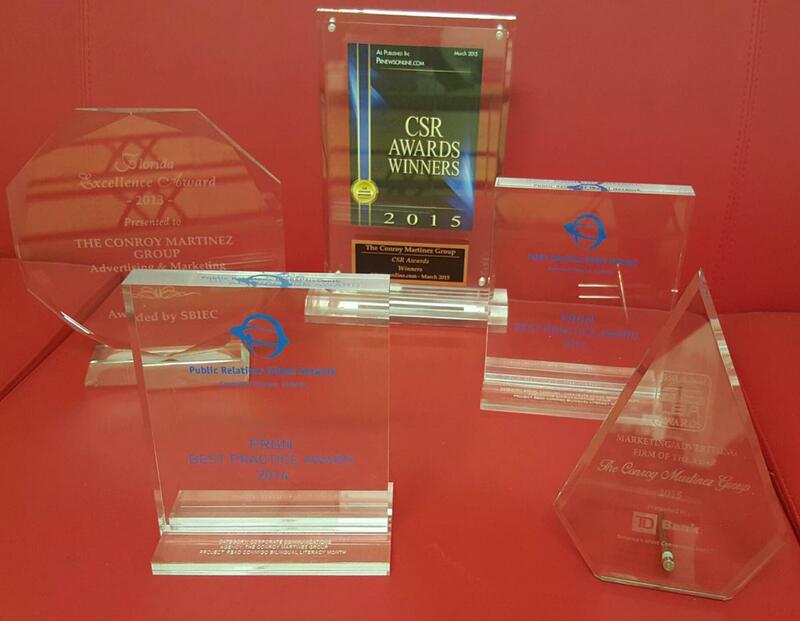 Every day is an award-worthy day at The Conroy Martinez Group because every day we work to improve customer success. So although we could measure our success by the awards in our cabinet, we instead measure our success by our clients' happiness and success. When you're seeking a public relations and marketing agency in Miami to bring you the world, be sure to include us in your consideration.